Fortunately this time around it’s much simpler, because Steam is much simpler. Valve doesn’t do timed/flash/daily sales with extra discounts any more, presumably because the number of games has swelled to the point where focusing the profit on a lucky few titles was actually losing them money elsewhere. I’m sure the fact that obsessives like me had figured out their rules and had been gaming the system for a while also factored into that decision. Regardless of the reason, though, today’s Steam sales apply just one level of discount to each participating game, and that’s the discount that applies throughout the lifetime of the sale. If you’re basing it purely on price, this makes the buy/not-buy decision very easy: you can check the sale on the first day and either the discount is worth it or it isn’t, with no other factors muddying the waters. 1) Don’t buy anything you’re not going to play within the next couple of days at most, and certainly NEVER buy a game “for later”. Steam sales are cyclical. The summer and winter sales happen like clockwork every year and show no signs of ever going away. Steam also still does weekend sales for high-profile titles and midweek sales for midrange titles, and the discounts on these are just as good as you’ll find in one of their big sale events. This ensures that the thing you’re interested in will be on sale again in the future, and it’ll likely be cheaper too. If you’re not going to play that game right now you can probably afford to wait the 3 to 6 months it’ll take for it to come up again. I can guarantee you’ll save far more money following this rule than you will gaming the Steam sales any other way. A legitimate objection to this approach is that I just made the argument that your free time is precious, but what I just suggested basically relies on you checking the Steam store every day. Or it would if we lived in the bad old days; fortunately the Steam of today is pretty smart about trying to separate you from your money any way it can, which brings me to the second rule of Steam sales. 2) Use Steam’s wishlist to keep track of games you’re interested in. Steam’s wishlist is ostensibly a way for friends to see which games you want and potentially gift them to you if they’re feeling particularly generous. It works fine for this, but the real value of the wishlist is that whenever anything on it goes on sale Steam will let you know by sending you an email. This ensures that you don’t have to faff about checking the store daily – be warned, though, that you won’t get these emails when a big sale event kicks off, presumably because you’d end up being spammed with dozens of them depending on how much stuff is on the wishlist. The wishlist is also useful for preventing any interesting games you find from being lost in the raging torrent of anime dating sims. Steam might be the only online storefront in the world that is actually worse than Amazon for general browsing purposes, so this is an important function. 3) Beware of seemingly-big discounts on expensive games. I have some sad news: after nearly two decades of inflation-proof RRPs the sticker price on AAA PC releases is finally going up. It’s rare you’ll find one selling on release for less than £40 these days. Still, there are savings to be had despite this; if you do find yourself buying an AAA PC title on release my advice is to actually not do that directly through Steam. It used to be a really good idea to check Amazon for box copies that usually came with a tenner or so knocked off the RRP; since they were usually integrated with Steam anyway you lost nothing by doing this. Unfortunately — barring Collector’s Editions and the like — physical copies of PC games are a dying breed, making Amazon less reliable for savings these days (it’s still worth checking though). 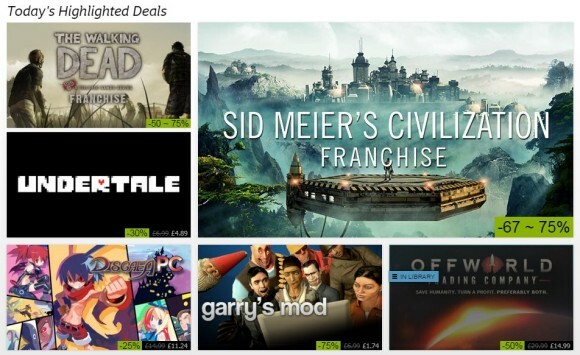 Recently the best approach I’ve found for buying Steam games on release has been to do it through Green Man Gaming, who let you buy one game for 20% off each month via a rotating discount code, and if that game is integrated with Steam they’ll usually offer a Steam code — do pay attention to that last point, though, as you might end up with a code for Origin or Uplay instead, and while competition has forced them into being far better systems than they were in the past I appreciate they’re still carrying around a bit of a stigma. As for GMG themselves I’ve bought 20-odd games from them over the last four years with no problems whatsoever, so they’re pretty reliable as far as I’m concerned. But this is a post about Steam sales, and the point I wanted to make here is that while the RRP on release has gone up, it doesn’t stay up for very long. Unless you’re talking about Call of Duty or Grand Theft Auto there’s a very high chance that the RRP will have been slashed down to £30 or less within six months of release. That 25% saving on a £40 game might look attractive now, but bear in mind that you’re still paying £30 and it’ll likely be cheaper very soon. The RRP is actually more likely to go down than the discount level these days, in fact, which brings me to rule 4. 4) Discount bands aren’t quite as generous as they used to be. A natural consequence of Steam abolishing daily and flash sales is that game prices don’t have to be cut quite so much to participate. You’ll still see 75% off a lot of things, especially older games or package deals, but 80/90% off is mostly reserved for games that a developer or publisher is trying to squeeze a few last pennies out of. 66% is now a “decent” level of discount, and even 50% is reasonable, especially if the RRP is set at a sane level rather than an artificially inflated one (see rule 3 above). Basically, don’t be too picky about holding out for a deeper discount later as you’ll probably be waiting a while. This forms a positive version of rule 1: if you do want to play the game right now and you’re reasonably happy with its price tag, then don’t faff about and just buy the game now. It’ll be worth the few extra pounds you’d otherwise be saving by waiting, and that goes for things with inflated price tags too. At the end of the day a game is worth exactly the amount you are willing to pay for it, and even £40 is a fine price for a game if you know what you’re getting into and are sure you’ll get a decent amount of enjoyment out of it. In my case I wouldn’t consider paying that much for anything I wasn’t going to get at least 15-20 hours out of, but as long as that’s the case I’ll hand over the money without suffering from even the slightest hint of buyer’s remorse. I guess the gist of this post is: don’t worry about gaming the sales. If your objective is to simply buy games that you will enjoy playing then it just isn’t necessary any more. Everyone mentally separates things into “Buy on release” and “Buy on sale”, but for anything in the latter category it’s your gut feeling that’ll help you out more than anything else. Anyway, your free time is far too precious to waste playing games that were cheap when you could have been playing games that were fun. Ideally you’ll be playing something that’s both — even if it’s an anime dating sim — but aside from using the Wishlist there’s very little effort involved in achieving that overlap – because it’s largely out of your hands now. That’s modern Steam sales for you. Probably the refund system was the thing that killed off fluctuating discounts (i.e. flash sales/dailies), as there’d just be a flood of refund requests whenever the price dipped lower. Oooh, that’s an excellent point. I’d completely forgotten they’d introduced the refund system in the last year, and you’re right that it’d make time-limited deals very awkward. Completely agree. Buying the one game I actually want to play, even if it’s not on sale, saves much more money than buying games I don’t feel like playing now but buy because they are a “good deal”. Buying something to languish in my backlog is never a good deal, no matter the price. It took me a surprisingly long time to figure this out, but about three years ago I instituted a rule of “one in, one out” and it really made me appreciate the value of a game I want to play right now versus one that I think might be interesting but which I’m not really in the mood for, as slogging through what was in my backlog at the time was actually pretty painful – I wasn’t invested at all. I didn’t stick to that rule for long, but the experience did completely change the way I approach buying stuff on Steam. Paradox destroys this rule. They are constantly calling you back for more and more DLCs. Other games like FTL, Desktop Dungeons, Rise of Nations, Civilization – they just wake up once in a while to destroy some of my time (and this is a problem I can not solve). Europa Universalis 4 also asks me to by new stuff. I didn’t realise they didn’t send out emails about games on your wishlist when it was a sale event. I’ve been sitting here waiting for notifications, totally unaware there was even a sale on.